Well, I haven’t been able to get enthused about reading for a long time. Still collecting though. I’ve picked up a several new books since that last long time ago post. L. Sprague de Camp and Fletcher Pratt’s The Carnelian Cube, the Northwest of Earth collection from C.L. Moore, another collection, The Menace from Earth by Mr. Heinlein and currently a signed, inscribed non-fiction work Lost Continents from L. Sprague de Camp is on the way. I also picked up a seemingly near-new jacket for The Porcelain Magician by Frank Owen. I say ‘seemingly’ because the thing had a rather severe crease right down the center of the spine. So severe in fact, that it promptly fell in two when extracting it from the shipping tube. I was very disappointed, but thankfully the vendor was great and gave me a full refund. I’m going to send it away to a restorer to get a quote on repairing it. I haven’t had much luck with dust jackets lately as the jacket for The Menace from Earth has some ball-point pen writing on the front. It was invisible in the auction image and the seller never mentioned it. The markings are faint, but obvious to any cursory examination, and unmistakeable to a collector. I think I’ll send that away for a restoration price too. It’s a real shame as the book and the jacket are in very good condition otherwise. Still, the restoration route could be interesting. Also I’ve been expanding my Gene Wolfe collection. I succumbed and picked up PS Publishing’s limited (100 copies) and slip-cased first edition of The Very Best of Gene Wolfe, as well as the similarly limited and slip-cased first edition (250 copies) of Kerosina’s Storeys from the Old Hotel. In addition, I picked up The Shadow of the Torturer series from Innovation Comics, based on Gene Wolfe’s legendary books. I never knew this existed until I ran into it on eBay. Apparently it was supposed to run to 6 issues, but only made it to three. I wish it ran to completion. It’s quite good. Also, I’ve been part of a book myself!! When I was president of the Seoul Photo Club, back in 2009 we embarked on something called The Seoul Metro Project. The fruits of which you can find on Magcloud. It’s one photo from every stop in the Seoul subway system (over 400!) pulled together into a beautiful coffee table photo book in which I contributed a section on Line 3. Many thanks must go to my good friend, Seoul Photo Club stalwart and one of the finest photographers I know, Flash Parker whose brainchild the whole thing was and who put the book together. I recently wrote an article outlining the background to the project that will be published in next (February 2012) edition of Groove Korea magazine. I hate it when that happens. I forgot about an auction last Friday. Actually, I remembered it about 15 minutes after it finished. 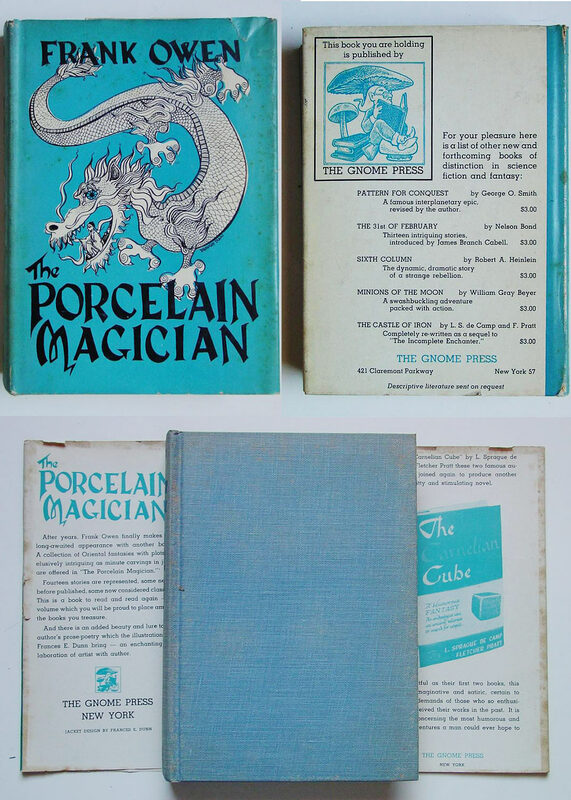 The book in question was a copy of The Porcelain Magician, a collection from Frank Owen. I normally don’t forget these things, and usually set an alarm to remind myself about them. My iPhone gives me an alert shortly before auctions finish in any case.. On Friday however, things were a little hectic. Being the native-speaking English teacher at my middle school here in Seoul, I run the speaking tests for the students at the end of each semester. I develop a test for each class and organize their prep and test classes – it’s a very hectic couple of weeks (two in each semester), and probably my busiest time of the year. Well, that and developing the English vacation class programs. But anyway, last week was preparation week and on Friday morning I happened to be running around like a blue-assed fly (a term my dead grandfather used to use…) and the alerts went off in my pocket, but I didn’t notice them. At least not until I took small break and checked my iPhone. So I was a little annoyed with myself after that (to say the least) and I still haven’t gotten completely over it. The reason I was (and are still slightly) upset is that this particular book was in pretty good condition. There are several GP books that for some reason seem to be notoriously difficult to find in even VG condition, let alone Fine. This is one of those titles. Many thanks to the seller who let me use his images here. You can see that it’s a bit worn and has a couple of small tears. Foxing and discoloration are quite visible. Probably in Good condition at best. It is all in one piece though, and a Brodart (or similar) cover would make a huge difference to the appearance. A slightly faded spine was mentioned, and though not entirely visible here, from what little is, it doesn’t look to be too bad. Just on the spine thing, is it just me or have any other collectors out there noticed that a few GP titles have a chronic problem with faded spines? I mean it’s next to impossible to find a copy of either this, Castle of Iron, Pattern for Conquest or Minions of the Moon without at least a little, if not significantly faded spines. Anyway, I would have been prepared to go as high as about $50, but there was only one bid, and it went for the starting price of $19.50. This is, I think, an excellent buy for this title in this condition. Congrats to the winner. But it would have been mine if not for my lapse in attention….